Paul on keyboards, previously with local band Reincarnate, joined in 1983. The addition of keyboards added an additional dimension of sophistication to the raw rock of the original line-up, and another songwriter to the fold. 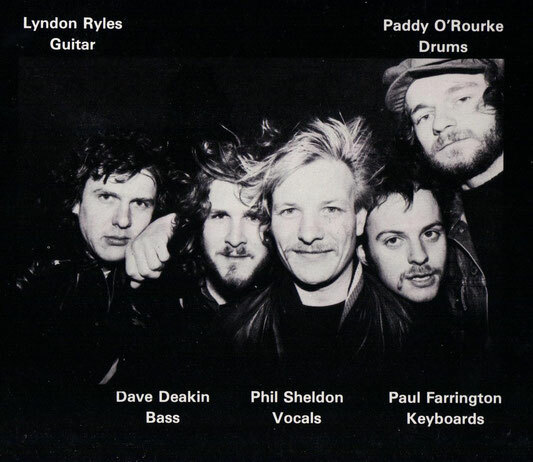 After honing performances on the road for a number of months, the band felt ready to make it’s first commercial recording at AVM studios in Stoke-on-Trent, which culminated in the release of the EP “Out on the Street” in January 1984 (see Resources for details of Harrier’s recordings). A very limited number of these original vinyl 7" singles and 12" EP's are available - please contact us if you are interested in purchasing. Throughout the next 18 months, the band gigged extensively in support of the EP, as well as writing a considerable amount of new material, which was recorded in late 1985 at StarTrak Studios. Only two of these tracks—”Leave me now” (under the Harrier name) and "Kill Two Birds" (under the Cheater name) - were officially released on the Potteries compilation album “To Boldly Go” released in early 1986. The remainder of the tracks do appear in "Bootleg" form from various sources on the web. we have a few of the original "To Boldly Go" vinyl LP's available - please contact us if you are interested in purchasing. The band stopped gigging in 1985 when Paul left to join Mad Hatter (and later Demon) and Dave emigrated to the USA. They came together again for a one-off gig almost 25 years later in 2009 at the Swan in Leek, Staffordshire, England as a tribute to our recently lost lighting engineer Jeff (the lad) Farrington. 2009 also saw a limited release of the remixed Out on the Street EP on CD. In 2012, Harrier released the even more limited Live at Leek CD covering all the original tracks from the 2009 reunion. Contact us if you are interested in purchasing either of these CD's.